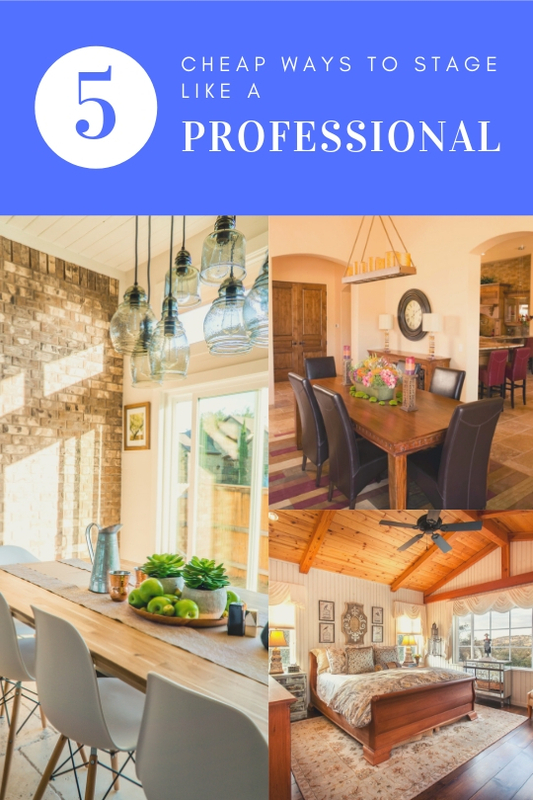 Staging a home is relatively new in the past 20 to 30 years but more and more people are doing it and agents are almost requiring it in order to get the max profit from the sale of a home. While you can hire professional home stagers that cost hundreds if not thousands of dollars, there are some tips and tricks that they use that you can implement and save yourself a ton of money. If you're planning on selling your Colorado Springs home in the next few months, take a look at these five cheap ways to stage your home like a professional. #1. Remove all personal items. As your agent, I'm going to say this anyway, but, nine times out of 10, many homeowners don't do it. Remember, you're trying to sell the house, not your personal collections, belongings, or photographs. Buyers don't care about that cute little family photo you took in the pumpkin patch last year. They need to see the house and anything that distracts them will only distract them from making an offer as well. Put away any religious items, personal photos, sports memorabilia, and collections. You want buyers to see themselves in the home, not you. Again, this is something that every real estate agent will tell you to do but it is extremely important, potentially one of the most important steps. If you've been watching Marie Kondo and how to organize your life, she says to get rid of everything that does not bring you joy. Now, I understand that a hammer may not bring you joy, but it is a necessity, however, do you need 12 of them? Remove everything out of closets, drawers, cupboards, pantries, and any other storage in the house and pack it up lovingly and put just a couple of things back so each storage area in the house looks clean and clutter free. Remove everything off of counters, desks, and dressers and put 1 to 3 things back, no more. #3. Make sure every room has a purpose. Have you turned your dining room into the makeshift playroom because you just don't use the dining room? It's time to turn that room back into what it was meant to be. Every room needs a purpose so stage the dining room with a lovely table and chairs and set the table. This works particularly good if you never use it. It stays beautifully set until you sell. Bathrooms should be arranged as if they are a spa-like oasis with baskets of toiletries and rolled up linens. A larger bedroom can have a sitting area in the corner complete with a lamp, table, book, and eyeglasses. Outdoor kitchen areas can set the stage for an evening of entertainment with a bottle of wine, a couple of glasses, and maybe a bowl of fruit, ready for that backyard barbecue. Many homeowners simply clean and miss the deodorizing part. Of course, you need to have a clean house in order to get the most profit from the sale, but have you become nose blind to the odors in your house? Do you have pets? Have you smoked in the house? Has there been a water leak in there still a mildew/musty smell? If you are unsure about your home's odors, have a trusted friend give the sniff test and then eliminate those odors before showing the house. If you have pets, remove all evidence of the pets including the pet during a showing. #5. Don't forget about curb appeal. Most featured images from a property listing will show the outside of the house or the view from the house so it needs to be amazing. That first impression is what will draw buyers to look further. Curb appeal is just as important as the inside of the house so make sure the lawn is carefully mowed, sidewalks and walkways are trimmed and edged, there's no debris or leaves on the sidewalk, the driveway is pressure washed, consider painting the trim or the front door, and verify that the front porch is clear for buyers and their agents as they wait to enter the house. These are probably the most common ways that stagers set up a listed home. By going down the list and making note of everything that needs to be changed, corrected, and designed, you can inexpensively stage your home just like a pro. Every home is different so if you have a unique layout that you are stuck on how to stage, give me a call. I have sold hundreds of homes in the Colorado Springs area and would love to give some tips and advice on what Colorado Springs buyers are looking for. 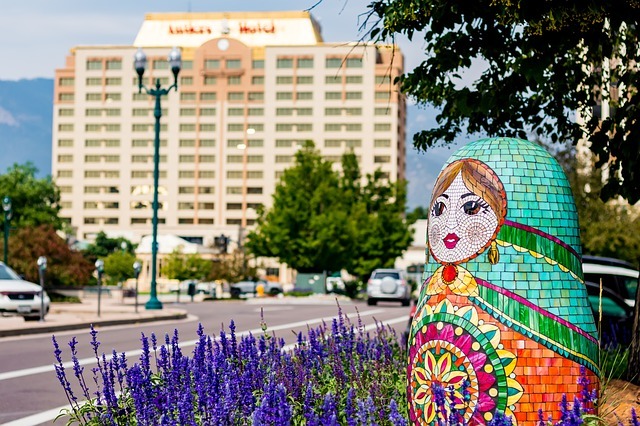 Colorado Springs is the #3 Best Place to Live in the U.S. But, you don't have to take my word for it, according to US News & World Report, Colorado Springs has been named as the #3 Best Pl. to live in the country. US News & World Report measures affordability, the local job market, and quality of life to determine some of the best places to live in the country. This global authority in ranking and consumer advice has just recently unveiled its 2019 best places to live in the country. It evaluates the country's 125 most populous metro areas and for the third year in a row, Austin Texas takes the number 1 spot. Number two is followed by Denver, and our own Colorado Springs takes the #3 spot, followed by Fayetteville Arkansas, and Des Moines's Iowa. The majority of the 25 best places to live are located in the middle of the country even though the tech boom on the Pacific Northwest, San Francisco, and Seattle market do make the top 10 and number 7, 8, and 9 respectively. Washington DC has dropped to number 19 after being 8 last year due to a decrease in housing affordability and net migration. The only city in the Northwest to crack the top 20 was Portland Maine coming ahead of Boston which was number 27. New York City ranks number 90 on the list. Northeastern cities are the epicenter of higher education and economic development, however, they are not growing nearly as much is like places in Florida, California, and of course, Texas. Plus, northeastern cities are expensive to live in with a higher cost of living is low affordability. Some of the top ranking places have steady job growth, affordability, and high quality of life. US News & World Report determines the ranking using a public survey of thousands of individuals throughout the country. They determine what qualities people consider important in a home town, at least towns larger than 125,000 people. They also look at rankings of best high schools, best hospitals, low cost of living, retirement usage, job growth, and the housing market. So, congratulations Colorado Springs, you came in #3! Want to find out why everyone is moving here? Start your online search here for free or simply give me a call and be connected to an award-winning Colorado Springs agent today! Well, take some quick advice: Don't keep spending. Here's a tip: You don't need the extended home warranty. What Size of Storage Should I Get? If you need a storage unit, there are many questions you should ask before you pick one. For example: What size unit do you need? How much does a storage unit cost? Choosing a storage unit may seem daunting at first, but if you've reached that point where you've run out of space in your home for all of your belongings, it's time to dive in. Here are some questions to ask to ensure you find the right storage unit for you. Before you begin your search for the right unit, make a list of all the items you'll be storing. This way you can save time by focusing only on storage facilities that meet your needs in terms of size. A 5-by-5 unit is the size of a small closet and could hold several small- to medium-size boxes, a dresser, or a single bed. A 5-by-10 unit is comparable to a walk-in closet, which could hold larger furnishings such as a queen-size bed or couch. A 10-by-10 unit could hold two bedrooms' worth of furnishings. A 10-by-20 unit is equal to a standard one-car garage, and could hold the contents of a multiple-bedroom house. Prefer not to climb over mountains of tubs and boxes to track down something stashed at the far reaches of that space? Choose a unit that allows entry on either side. "How many times do you put something in the back of a closet only to find that you need it? The same thing happens with a storage unit," explains Willie Dvorak, owner of AAA Storage in Mellette, SD. "Ensuring you can access your goodies from both sides of the unit makes it that much easier to find what you need quickly and safely." A 5-by-5 unit costs about $40 to $50 a month. A 10-by-20 unit costs about $95 to $155 a month. A 20-by-20 unit costs about $225 a month. What good is having a storage unit if it's hard to access, both in terms of its location and its design? Dvorak outlines what to look for when selecting a facility. "If you can't get your vehicle close enough to the unit, you'll be lugging your stuff feet—even yards—in both directions," he says. "While it may not seem like a long walk as you look at the unit, imagine carrying all of your stuff back and forth all of that way. When you're storing stuff, every step is a nuisance. And, when you are stressed, you're more prone to accidents. Turning that rental truck around just adds to the stress. Be sure you can pull up the unit and get your vehicle turned around without any trouble." What are the storage facility's hours? Once you've unloaded your belongings, you still want to know that you can reach them in a hurry should you have the desire. "It's hard to predict when you'll need that hiking gear you haven't used for years, Grandma's scrapbook, or that special award you want to show off," Dvorak notes. "Don't miss out because you think of it after they've locked things up for the night (or weekend). Make sure you can access your stuff 24 hours a day, 7 days a week." Fred Levine, founder of Little Hard Hats, recommends reading all of the fine print of the contract to determine how long the price is guaranteed. "They routinely get you in, then shortly thereafter, once you’ve moved all your stuff in, they sometimes raise the rates," he cautions. "Understanding the payment policy can also help you make decisions about a storage facility," says Caitlin Hoff of consumersafety.org. "What is the late fee or policy? Some facilities will auction your storage unit if rent is not paid after a certain amount of time. Does your facility allow for online payments? If it doesn't, do you have to pay in person? Knowing the full extent of the policy can narrow down a list of facilities." Ask how the storage unit facility is secured. Is there a guard? Video surveillance? Alarms? Is the area well-lit? Also, don't assume the facility is going to cover damages to your possessions inside the storage unit in case of an accident. Check your homeowners policy, and purchase a rider if necessary. Depending on the items you are looking to store, you might debate whether or not you want a climate-controlled storage unit. A climate-controlled unit is better for items such as appliances or antiques that might be damaged in extreme temperatures. No one wants to find that a family of critters has turned your family heirlooms into their home. "If you are looking at an outdoor storage unit, you want to ask about pest control," says Hoff. "Ask if they have had issues with any insects or critters, and find out how they handle these situations." Eric Hoffer, president of Hoffer Pest Solutions, suggests doing your own detective work when you preview the facility. "Overgrown bushes, unkempt landscaping brushing up against the side of the building, and overflowing trash cans are not only a sign that maintenance may not be a priority for a storage facility, but these can be things that attract pests like rodents and roaches close to the building," he says. "All it takes is a small crack or gap in the wall to allow pests inside." If you're going to the trouble of storing your items for later use, you want to know they'll be in the best shape possible when you want them. Finding the right facility can make all the difference. Be honest: When was the last time you set foot in your guest bathroom? We're guessing it was probably the last time you hosted friends or family—and that might have been quite a while ago. It's easy to overlook this space, especially if it doesn't get much use. But to truly give your guests a warm welcome, your guest bathroom deserves to get some love, too. Plus, it's a spot where you can experiment with your decor style with less risk. "If there is one place in your home where you can afford to make a statement and have some great personality, it’s the guest bath," says Luke Caldwell, designer on HGTV's "Boise Boys." A guest bath will rarely be sprawling, but you can make your space appear larger and more inviting with a few simple design tweaks. Caldwell likes to make a little magic with mirrors—he installs full mirrorsfrom the top of the vanity to the ceiling. Then, he flanks the mirror with eye-level wall sconces, which allow light to reflect across the space. "It makes the room feel much larger and gives it a real timeless look," Caldwell explains. As a bonus, since wall sconces cross-illuminate, guests will always be in their best light; overhead lighting can cause shadows that nobody wants. Caldwell also likes floating vanities, noting they "make a space feel larger and more modern." Don't your friends and family deserve to feel like staying in your home is a true getaway? Give them a spa ambiance that transports them far from their mundane lives. But you don't need to go all in on the cucumber water and massage tables to achieve this look. Just start with the walls and paint them a tranquil shade of blue or hang a wallpaper print that's soothing, suggests Alicia Weaver of Alicia Weaver Design, in Fort Lauderdale, FL. "Organic or horizontal lines give the feeling of waves and water," Weaver says. "I love to use shades of blue, especially pale blue, for a spalike feel." For an extra dose of serenity, set out fluffy "guest only" towels that evoke comfort and luxury. Looking for something a little more chic? A black bathroom will show guests your design prowess. "I love breaking the design rule of avoiding dark colors in small spaces," notes Leslie Bowman of the Design Bar, an interior design studio in Burr Ridge, IL. "It gives such a dramatic pop." Keep it simple by sticking with two colors, like black and white. Add a gray tile or natural wood accents, which can provide visual balance to black fixtures. "Bathrooms that wow are stylishly accommodating to guests," says Pam Faulkner of Faulkner House Interior Redesign, in Herndon, VA.
To help get you there, she suggests taking steps to make guests more cozy and warm. Think: heated bathroom floors, towel warmers, and thermostat-controlled showers that ensure the water is always just the right temperature. These small touches can go a long way toward making your guests feel like they're at home—only better. "Bring life into the space with greens," suggests Gina Gutierrez of Gina Rachelle Design, an interior design firm in San Francisco. "I always like the look of succulents, air plants, or eucalyptus hanging from the shower head for a modern look." Even better, the moisture from the shower will help succulents grow and thrive. Sure, a well-cared-for house shows better: Small things like broken doorbells and leaky faucets make buyers wonder if your property also has bigger issues elsewhere. But more important, a little routine maintenance can help you avoid a catastrophic problem down the line that could devalue your property and derail that sale. What Do Successful Home Buyers Have in Common? First of all, we want to say congratulations. Buying a home, or even thinking about buying a home is a huge step. It’s an exciting milestone in your life and a wonderful investment. It can be so confusing when you think about how much credit you need in order to purchase a home. Many people also wonder how much money they need to be able to put down. Both of these answers are short and long. Today, we are going to tell you exactly how much credit you should have in order to buy a home. Keep reading to learn more. The first thing to keep in mind is that it doesn’t need to be high, the negative if it’s not high though is that your internet rate will be higher. This means it will end up costing you more money over time. Therefore, trying to have the highest credit score possible is a great goal. If you have started thinking about purchasing a home, it’s important to also try and boost your credit score. This does not mean going out and getting credit cards, so you can pay them off. In fact, you really don’t want any new credit cards coming in when you are trying to purchase a home loan. If you are getting ready (maybe a year or two away) from your first home, this is a great time to start preparing for the credit check by making it as high as possible. There are two factors that go together to determine how you can get in your mortgage. The first is your credit score and the second is your down payment. They work together to come up with your total. Since your home loan will go on for so many years, they want to ensure you have past examples that you will be able to pay every single month. The minimum you want to have is a 500-credit score with 10% down on a home. This should guarantee you a home with most loans. However, bigger the better. Having a credit score in the 600 range is a lot better to ensure your chances of getting a loan and for a better rate. Another factor that goes into your home mortgage is your salary. Your income should be at least 3 times your payment. That all may have been a little confusing for you. We hope we cleared it up. The more money you put down the better. The higher your credit score is the better. If you can make up for one of those you have a better chance of getting approved and having a lower interest rate. Keep working hard at increasing your credit by paying off your credit card monthly and not using it on purchases too large. For more tips on purchasing your first home, contact us today! Your furry friend is like a family member to you. They probably feel (and sometimes act) like one of the kids. Are we right? If you answered yes, you probably want to incorporate their needs into your housing purchase. Keep reading to learn how you can keep your dog in mind while purchasing your home. Some areas have HOA rules and regulations. If you are looking into communities with these laws, make sure there are not rules for dogs. Some even say you cannot have them. Some of the rules are not strict, but it is still important to keep any restrictions in mind. If you have a larger dog a backyard is always a nice addition to the house. It’s important to have a well secured fence if you have a backyard though. The first step is to ensure the HOA does not have any rules against this. If there already is a fence, that’s a great positive! Fences are not impossible to build, so it’s something you can always add in the future. However, you can’t add a backyard if you don’t have the room on your property. If you have a larger dog, this is a great addition to keep in mind. If you don’t mind your pets roaming the neighborhood, this is something to keep in mind too. Some houses are way too close to large streets to be safe for dogs. Some neighborhoods also don’t like this. If you like the idea of your dog being able to roam around free, make sure you check out the neighborhood multiple times before purchasing. Try and find another dog family and ask them questions too. Some floors are terrible for dogs, they scratch instantly. If you plan on putting in new floors, try a distressed wood which will easily hide scratches. Also, luxury vinyl and laminate are great options. Carpet is never the best option, especially if it is lighter colors. Dogs bring in dirt and mud, it’s just natural for them to bring it in. That may mean a lot more vacuuming for you. Try and stay away from a lot of carpet, and if you do don’t get a pure white option. If your dog is getting older stairs may not be the best option for them. If you want a two-story home and do have a dog, make sure the first floor is equipped with everything they will need. If not now, you never know what will happen in the future. Picking them up every time they need to go outside can end up being a lot of work. When selling your home, one of the most important steps is showing your home to potential buyers. If you make mistakes during this crucial step, you can drive away buyers, and cost yourself offers on your home. This is why staging your home is so important, and why you should make sure to not have these things out in view during a home showing. You want to make sure your home is appealing to as many buyers as possible, and if you lay your political views on the line, you may instantly be driving away half of your potential offers. Make sure to put away any political pictures, flags, or other items you may have out in your home. For avid hunters, this one may be difficult, but it is very important to put away any weapons or taxidermy displays that you may have showcased in your home. Hunting displays such as deer mounted on the walls may give off a sense of dread to some potential buyers, and weapons may take the focus off of your home’s great features, and just make buyers remember your house as the one with the swords or guns. Make sure to lock up or store any valuable items before showing your home to potential buyers. You will have strangers in your home walking around, and you do not want anything to go missing. Make sure to put away any R rated material before you show your home, because many potential buyers may be with their families. The last thing you want during a showing is to make your guests uncomfortable with adult art pieces, or sexual objects. While your family photos add sentimental value to your home for yourself, it will not for your potential buyers. You want to make sure that buyers are able to picture themselves living in your home, and they will not be able to do that with dozens of your family’s photos hanging on the walls. You may be packing up the home as you are selling it, but make sure to keep your moving boxes put away during showings. Moving boxes will make your home seem cluttered, and will not give off the most livable impression of your home. Home showings are an extremely important part of the home selling process, so make sure not to damage your home’s appeal by leaving these objects out. If you think ahead, and stage your home properly, you will have a great home showing, and improve your chances of receiving a fantastic offer. If you would like to learn more about how to properly sell your home, contact us today!